Social Class in the U.S. Most social scientists agree that American society is stratified into social classes, based on wealth, education, and occupation. There are competing models for dividing society into discrete classes, but most are based upon a basic three-tiered model that includes an upper class, middle class, and lower class. Each social class is thought to share particular cultural traits, such as manner of dress and speech, that reinforce divisions between different classes. The “American Dream” holds that U.S. society is meritocratic and status is based on individual achievement, but many social scientists tend to support the idea that inequality is persistent in America and often results from inherited advantages or disadvantages. In the United States, most social scientists agree that society is stratified into a hierarchical arrangement of social classes. Social classes are groupings of individuals in a hierarchy, usually based on wealth, educational attainment, occupation, income, and membership in a subculture or social network. Social class in the United States is a controversial topic; there have been many competing definitions, models, and even disagreements over its very existence. Many Americans believe in a simple three-class model that includes the rich or upper class, the middle class, and the poor or working class. More complex models that have been proposed by social scientists describe as many as a dozen class levels. Meanwhile, some scholars deny the very existence of discrete social classes in American society. In spite of this debate, most social scientists agree that in the United States, there is a social class structure in which people are hierarchically ranked. One social class model proposed by sociologists posits that there are six social classes in America. In this model, the upper class in America (3% of the population) is divided into the upper-upper class (1% of the U.S. population), earning hundreds of millions to billions of dollars in income per year, while the lower-upper class (2%) earns millions in annual income. The middle class (40%) is divided into the upper-middle class (14%, earning $76,000 or more per year) and the lower-middle class (26%, earning $46,000 to $75,000 annually). The working class (30%) earns $19,000 to $45,000. The lower class (27%) is divided into the working poor (13%, earning $9000 to $18,000) and the underclass (14%, earning under $9000). This model has gained traction as a tool for thinking about social classes in America, but it notably does not fully account for variations in status based on non-economic factors, such as education and occupational prestige. This critique is somewhat mitigated by the fact that income is often closely aligned with other indicators of status: Those with high incomes likely have substantial education, high-status occupations, and powerful social networks. Another model for thinking about social class in the United States attributes the following general characteristics to each tier: The upper class has vast accumulated wealth and significant control over corporations and political institutions, and their privilege is usually inherited; the corporate elite is a class of high-salaried stockholders, such as CEOs, who do not necessarily have inherited privilege but have achieved high status through their careers; the upper middle class consists of highly educated salaried professionals whose occupations are held in high esteem, such as lawyers, engineers, and professors; the middle class is the most vaguely defined and largest social class, and is generally thought to include people in mid-level managerial positions or relatively low status professional positions, such as high school teachers and small business owners; the working class generally refers to those without college degrees who do unskilled service work, such as being a sales clerk or housecleaner, and it includes most people whose incomes fall below the poverty line. Since the middle class is the largest yet most vaguely defined class, it is important to think about how people come to identify themselves as “middle class.” Some people define middle class by income, whereas others are more concerned with values and job description. For example, one may define themselves as middle class if they needed to go to college to obtain their job, despite having a lower income than a blue-collar worker. Another person may believe that since he makes $100,000 a year (regardless of his job status), he is middle class. Most people define middle class in terms of income and values (such as education and religion). Sociologists studying class distinctions since the 1970s have found that social classes each have unique cultural traits. The phenomenon, referred to as class culture, has been shown to have a strong influence on the mundane lives of people. Class culture is thought to affect everything from the manner in which people raise their children, to how they initiate and maintain romantic relationships, to the color in which they paint their houses. The overall tendency of individuals to associate mostly with those of equal standing as themselves has strengthened class differences. Because individuals’ social networks tend to be within their own class, they acculturate to, or learn the values and behaviors of, their own class. Due to class mobility, in some cases, individuals may also acculturate to the culture of another class when ascending or descending in the social order. Nonetheless, the impact of class culture on the social hierarchy is significant. According to the logic of the American Dream, American society is meritocratic and class is achievement based. In other words, one’s membership in a particular social class is based on their educational and career accomplishments, and class distinctions, therefore, are not rigid. Many sociologists dispute the existence of such class mobility and point to the ways in which social class is inherited. Social theorists who dispute the existence of social classes in the United States tend to argue that society is stratified along a continuous gradation, rather than into delineated categories. In other words, there is inequality in America, with some people attaining higher status and higher standards of living than others. There is no clear place to draw the line separating one status group from the next. Individual and household income remains one of the most prominent indicators of class status within the United States. Personal income is an individual’s total earnings from wages, investment earnings, and other sources, and the mostly widely cited data on personal income comes from the U.S. Census Bureau ‘s population surveys. Though individuals in a household may hold low prestige or low earning jobs, having multiple incomes can allow for upward class mobility as a household’s wealth increases. According to the U.S. Census, men tend to have higher income than women, while Asians and whites earned more than African Americans and Hispanics. U.S. Census Bureau: The government agency that is responsible for the United States Census, which gathers national demographic and economic data. Bureau of Economic Analysis: The Bureau of Economic Analysis (BEA) is an agency in the United States Department of Commerce that measures important economic statistics, including the gross domestic product of the United States. personal income: All of an individual’s monetary earnings, including salary, investment gains, inheritance, and any other gains. Income in the United States is most commonly measured by U.S. Census Bureau in terms of either household or individual income and remains one of the most prominent indicators of class status. Income is not one of its causes. In other words, income does not determine the status of an individual or household but rather reflects that status. Some say that income and prestige are the incentives provided by society in order to fill needed positions with the most qualified and motivated personnel possible. Personal income is an individual’s total earnings from wages, investment interest, and other sources. In the United States, the most widely cited personal income statistics are the Bureau of Economic Analysis’s personal income and the Census Bureau’s per capita money income. The Census Bureau also produces alternative estimates of income and poverty based on broadened definitions of income that include many components that are not included in money income. Estimates are available by demographic characteristics of householders and by the composition of households. According to the US Census, men tend to have higher income than women, while Asians and whites earned more than African Americans and Hispanics. The combination of two or more incomes allows for households to increase their income substantially without moving higher on the occupational ladder or attaining higher educational degrees. Thus, it is important to remember that the favorable economic position of households in the top two quintiles is in some cases, the result of combined income, rather than the high status of a single worker. 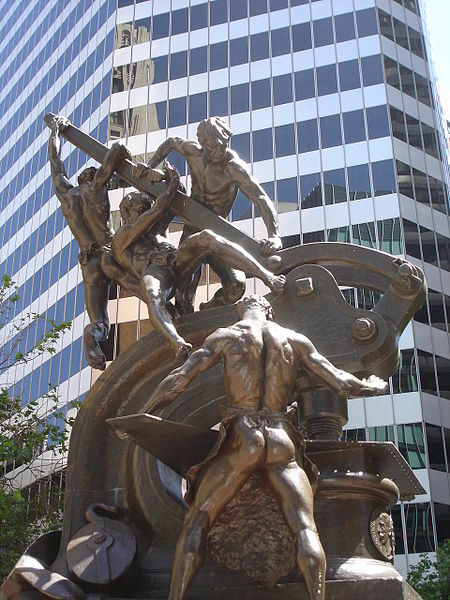 Working class: A monument to the working and supporting classes along Market Street in the heart of San Francisco’s Financial District, home to tens-of-thousands of professional upper class and managerial middle class workers. Wealth is commonly measured in terms of net worth, which is the sum of all assets, including home equity, minus all liabilities. The wealth — more specifically, the median net worth —of households in the United States varies with relation to race, education, geographic location, and gender. While income is often seen as a type of wealth in colloquial language use, wealth and income are different measures of economic prosperity. Assets are known as the raw materials of wealth, and they consist primarily of stocks and other financial and non-financial property, particularly homeownership, that allows individuals to increase their wealth. Home ownership is one of the main sources of wealth among families in the United States, but can be inaccessible to low income households due to high interest rates. Assets: Any property or object of value that one possesses, usually considered as applicable to the payment of one’s debts. net worth: The total assets minus total liabilities of an individual or a company. Wealth in the United States is commonly measured in terms of net worth, which is the sum of all assets, including home equity, minus all liabilities. The wealth—more specifically, the median net worth—of households in the United States varies with relation to race, education, geographic location, and gender. While income is often seen as a type of wealth in colloquial language use, wealth and income are two substantially different measures of economic prosperity. While there may be a high correlation between income and wealth, the relationship cannot be described as causal. Assets are known as the raw materials of wealth, and they consist primarily of stocks and other financial and non-financial property, particularly home ownership, that allows individuals to increase their wealth. Home ownership is one of the main sources of wealth among families in the United States. However, there are racial differences in the acquisition of housing, and this inequality reproduces stratification in wealth across race. For white families, home ownership is worth, on average, $60,000 more than it is worth for black families. A lower proportion of people of color than white people have access to the financial resources needed to purchase a home with the intention of letting its value appreciate over time to increase personal wealth. In many communities with large minority populations, high interest rates can cause roadblocks to home ownership. Data on personal wealth in the United States shows that the inequality between the nation’s richest and poorest citizens is vast. For example, just 400 Americans have the same wealth as half of all Americans combined. 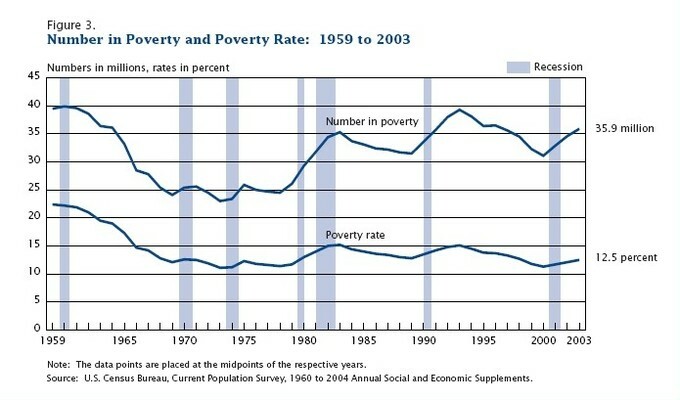 In 2007 more than 37 million U.S. citizens, or 12.5% of the population, were classified as poor by the Census Bureau. In 2007 the richest 1% of the American population owned 34.6% of the country’s total wealth, and the next 19% owned 50.5%. Thus, the top 20% of Americans owned 85% of the country’s wealth and the bottom 80% of the population owned 15%. 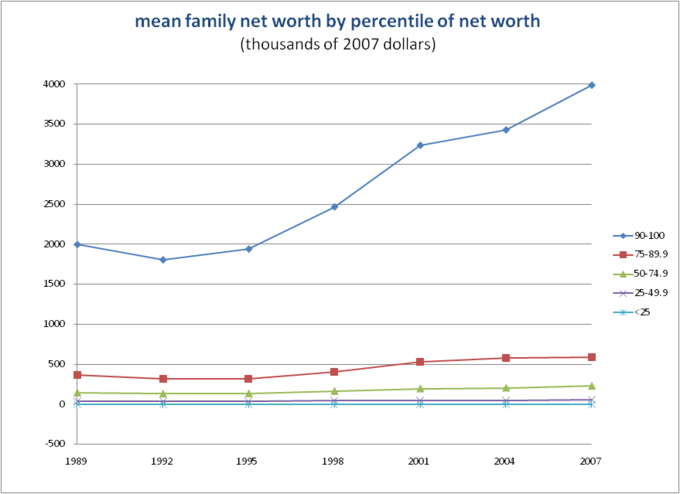 Mean Family Net Worth by Decile: This graph shows changes in the average net worth of families in each decile of the U.S. income hierarchy. In recent years, the average net worth of high-income families has grown significantly more than that of middle and lower-income families. In the United States, occupation and occupational prestige are primary indicators of social class, along with income, wealth, and education. High status professional occupations, such as those of a doctor, lawyer, or CEO, require high educational attainment and are associated with the upper-middle and upper classes. Occupation often corresponds with income and educational attainment, which combined determine a person’s social class. However, occupations with high occupational prestige can increase one’s social class without a corresponding increase in indicators, such as income. To enter the professions, a person usually must hold a professional degree. Examples of professional degrees include JDs for law, MDs for medicine, and MBAs for business. profession: An occupation, trade, craft, or activity in which one has a professed expertise in a particular area, especially one requiring a high level of skill or training. occupational prestige: The rating of a job based on the social esteem or respect granted to an occupation. In the United States, occupation is a primary indicator of social class, along with income, wealth, and education. Occupation is closely linked to Americans’ identities, and is a salient marker of status. The importance of occupation in part results from the substantial amount of time that American’s devote to their careers. The average work week in the United States for those employed full time is 42.9 hours long, and 30% of the population works more than 40 hours per week. High educational attainment is generally a pre-requisite for entering high status professional occupations. Professional occupations, sometimes called “the professions” or “white collar jobs,” include highly skilled positions, such as that of a lawyer, physician, and CEO. Having a professional occupation is associated with being a member of the upper-middle or upper class. To enter the professions, a person usually must hold a professional degree. Examples of professional degrees include JDs for law, MDs for medicine, and MBAs for business. Because the professions are considered highly skilled, require high educational attainment, and provide high incomes, they are associated with high social status. Sociologists often talk about the status associated with various occupations in terms of occupational prestige. Occupational prestige refers to the esteem in which society holds a particular occupation. Occupational prestige is one way in which occupation may affect a person’s social class independent of income and educational attainment. While high status occupations often reap high incomes and require significant education, in some cases these three variables are not linked. For example, being a university professor has high status and requires high educational attainment, but does not always result in high income. Its status depends upon the high esteem in which professors are held. In large part because of high occupational prestige, university professors are generally considered members of the upper-middle class. Conversely, funeral directors generally have high incomes and often high educational attainment. Being a funeral director is not a high status job, however, because Americans do not tend to hold the occupation in high esteem it has low occupational prestige. Funeral directors are, therefore, often considered members of the middle class. As illustrated by this example, occupations with high prestige can raise one’s social class even without improving one’s economic status. Occupation: The social class associated with a particular occupation can change over time as the esteem in which the occupation is held changes. 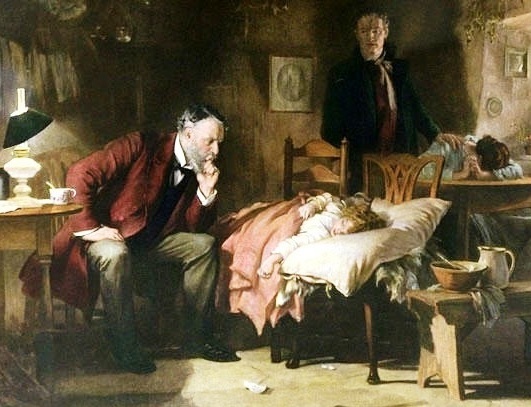 In the late-nineteenth century, at the time of this painting, doctors were not members of the upper class. As the occupation has come to require increased education and to depend upon increasing technological expertise, the occupation’s prestige has risen. Doctors are now commonly considered members of the upper-middle or upper class.